Finally planted into the ground on 7 July… so late! In a period of sunshine over the weekend (few and far between this summer) I got outside to transplant some crops into final positions in the garden. Some of my tomatoes and curcurbits had remained in pots (albeit quite large ones) in the greenhouse until now as the weather has been so bad, but finally I decided to bite the bullet and plant them out as space is limited in the greenhouse and other plants are expanding. I may get no harvest from them, but an Indian summer is possible and I can always eat the squashes before they ripen. 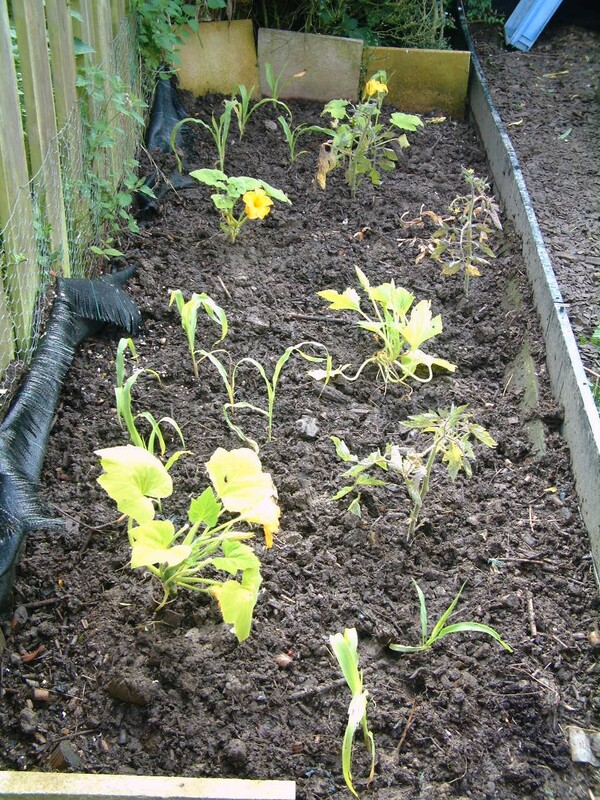 The picture shows maize (corn), summer and winter squash and tomatoes, but I also planted leeks, spring onions and salsify (sounds like a verb not a vegetable) elsewhere. 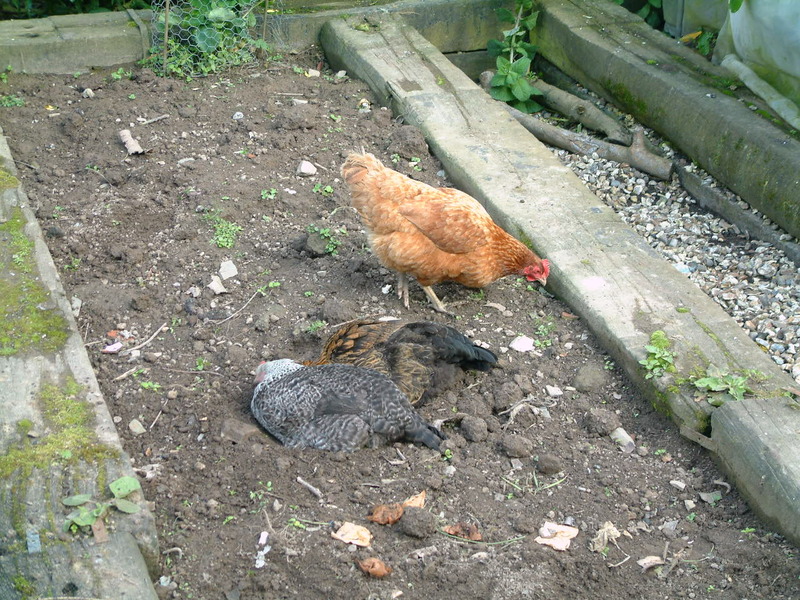 The chickens – old and new now an integrated flock – have been on the beds that were not planted up, keeping the weeds under control, cultivating, applying fertiliser and scrumming slugs. Trouble is that they scrum worms too. We have been quite worried that our worm population may have been severely reduced as a result of chicken predation, but I’m pleased to report that, even with the high water table bringing the worms nearer to the surface and thus more accessible to chickens, there was still a good population once I dug down just a few centimetres, including some nice big fat individuals. I guess they are thriving on the added organic matter (both compost and chicken droppings) and so it looks like we have a healthy thriving soil ecosystem. HURRAH! Of course, the rain returned all too soon and I was back indoors, where my thoughts turned to my other worms… the knitted variety. I am using amigurumi worms to test out the new yarns that have arrived. 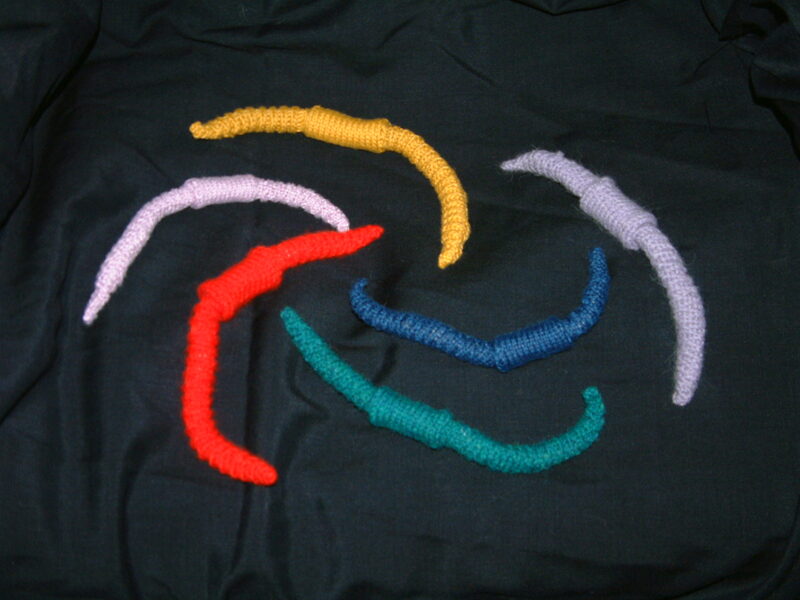 So far I have knitted worms of: acrylic, pure wool, a wool and silk mix, cotton, bamboo and soya. As I mentioned in a previous post, the latter two superficially appear to be natural fibres, but in fact are a type of rayon, so are chemically processed. And the results? Well, as you can see from the picture, they have come out rather different sizes. All the yarns I selected were supposed to be the same gauge (double knitting wool) but I had to use different sized needles to account for the amazing variation. All of the yarns have produced acceptable worms. I think that the yellow cotton yarn (Peruvian with the proceeds helping to fund children’s education in the communities who produce it) made too big a worm, but I think that it would make a lovely sweater. The soya (blue) and bamboo (pale pink on the left) yarns are quite similar and both are silky, although the bamboo has more of a sheen to it. They produced nice firm worms (I used quite small needles: 3mm) but the lack of stretch in the yarn made picking up stitches quite difficult and in the end I had to resort to using a crochet hook to do this for the bamboo. This is a bit of an issue with amigurumi, but probably wouldn’t matter if you were knitting a lovely twinset or a pair of socks. Actually I really enjoyed knitting both of them. The acrylic is cheap and cheerful – it hardly seems worthwhile putting all the effort into knitting a big garment out of it because of the quality, but it actually lends itself very well to knitting critters although it is a little floppy and would have been better on slightly smaller needles. And finally the two woolly yarns – the greenish worm is pure British wool (an oddment that I had left over from an ancient project) and was a joy to knit – just the right amount of give in the yarn so that picking up stitches was easy. The lilac silk and wool yarn (on the right) was very similar, but a little softer (I have some lovely bed socks made out of it). So my conclusion? Well, I’m still a fan of sheep’s wool. For my vegan customers I will keep experimenting with plant fibres (I have some hemp/cotton yarn ordered), but for me and those who don’t mind animal fibres, I will be sticking with wool. Oh, and the next experiment is knitting a ‘bath puff’ with the hemp/cotton…. seems better than the nylon options available in the shops. And, yes, clew really is the collective noun for worms!